Nothing tastes as good as fresh produce straight from your own garden. In this blog we’re showing you how to create a vegetable garden. 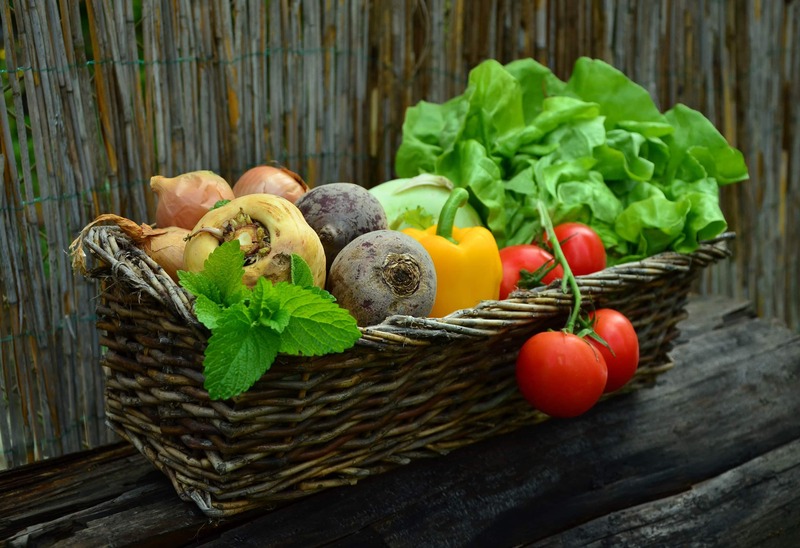 Vegetable growing is a real pleasure if you have everything you need to hand. I always advice people to look to visit their local allotments if they are planning a productive garden. Those people really know how to create a vegetable garden. The buildings might be a bit too ramshackle for your own back garden but of course, that’s something that can be remedied by asking a landscaper to help with the construction. Let’s examine the process bit by bit. Most vegetables like to grow in a sunny spot. And in my experience, most people like to use the sunniest spot in the garden to relax in themselves. A good garden designer will be able to look at your garden and come up with a plan that works for every garden occupant – human, canine, feline and vegetable. 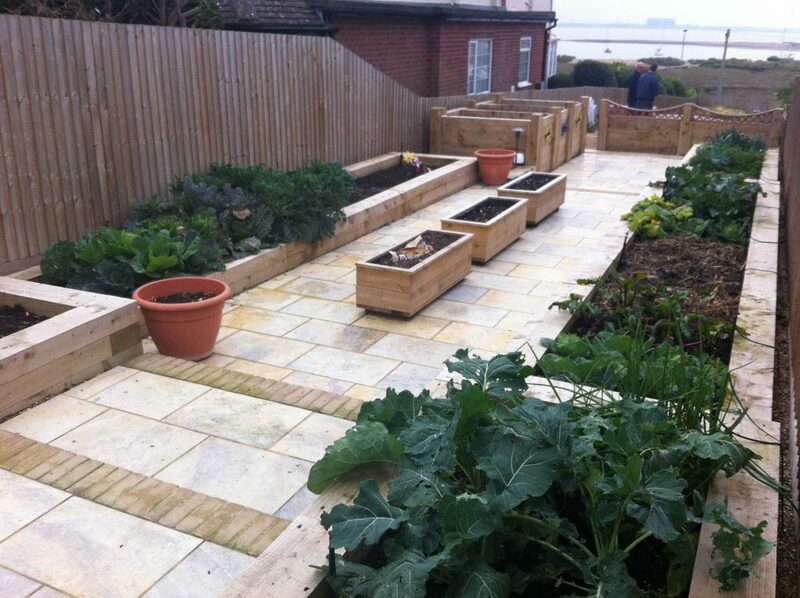 This productive garden in Mersea was built by Holland Landscapes. It has great sea views and plants are protected from strong winds by a pretty fence. Paving and raised beds allow all year round access for cultivating and harvesting. I am privileged to be landscaping gardens in Suffolk and Essex. Some of the coastal gardens can get pretty chilly with cold winds blowing in from the sea. It helps to use hedges and screens to create a microclimate and protect your precious seedlings. Veggies need looking after and harvesting in all weathers. Grass or dirt walkways can soon become muddy, slippery and unattractive in wet weather. A nice path can be built using pavers, bricks, self-compacting gravel or even reclaimed cobbles. That will give you a surface that doesn’t need weeding, won’t sit underneath puddles and is usable whatever the weather. In spring, a polytunnel can give you a good 3 week head start on growing out of doors. And another 3 weeks extra growing time at the end of the season too. One of my pals uses her polytunnel for food in spring summer and autumn and as a temporary chicken run when the weather is super-cold. The chickens love it because they get to clear up all the slugs and bugs that are trying to overwinter in the warm. A greenhouse too, allows you to control growing conditions so that you can grow tender crops like tomatoes, cucumbers, early salads and tender flowers. A beautiful greenhouses is stunning feature in itself – any food it produces is a bonus! 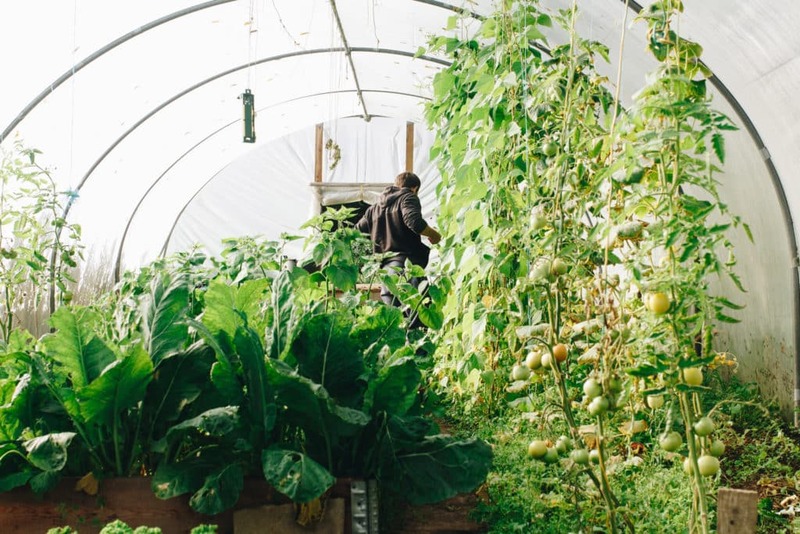 Polytunnels are designed for growing vegetables. They do need regular watering but other than that they’re great. I’ve blogged about soil types before. In most of Essex and Suffolk the soil has quite a high proportion of clay. Which is a mixture of benefits and challenges. Clay soils are very good at not letting plant nutrients wash through them – which is brilliant. On the other hand, they are heavy, hard to dig, soggy in winter and baked hard in summer. If you want to grow your own food and you have clay soil, I heartily recommend mixing in some good quality topsoil, or growing in raised beds. If you go to the allotments you’ll see a variety of different ways to set out veggie beds. My firm favourite is to use raised beds. You can control the soil type, you don’t need to walk on them so the soil doesn’t get compacted and they look good too. In a back garden, you don’t want to be looking at a patch of mud with some cabbages in, you need something that is visually appealing as well as practical. We’re usually lucky with rainfall in the UK but if the heavens do fail to open, you’ll need to water your vegetable garden. A simple hosepipe attached to a tap is normally fine. However, it can take quite a while to water the garden and standing around holding a hose can be boring. Modern irrigation systems are sophisticated enough to be operated from a phone app. So you can be sunning yourself in Marbella and watering the tomatoes at the same time. Brilliant! Will you have a man cave or a she shed? 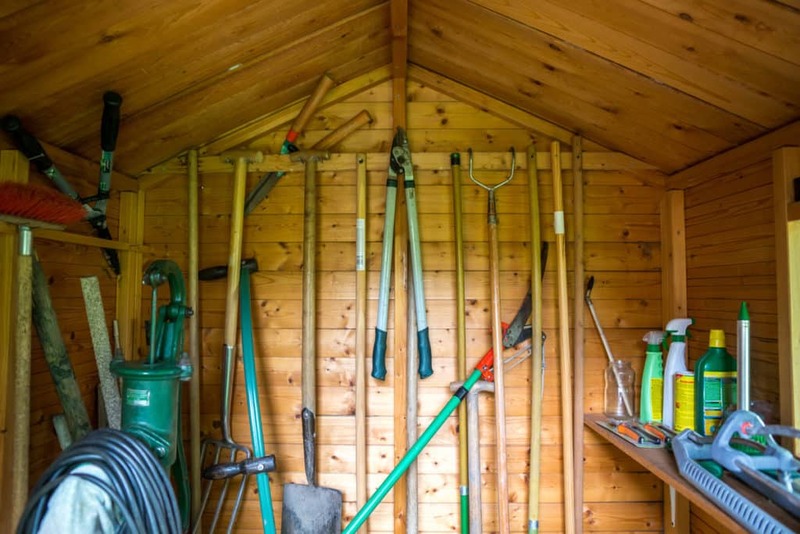 A vegetable gardener’s shed is a very special place. It’s essential of course for storing tools, fertiliser, seeds etc. It’s somewhere to hang your jumper when you get too warm and a handy place to retreat to in an unexpected rain shower. Personalise it with a paint job, a kettle and a comfy chair. I promise you’ll love it. We were just chatting about soil types. Adding home-made compost to your soil is a great way of keeping it in good heart. The RHS recommends having 3 compost bins. One to be filling, one to be “cooking” and one ready to use. You will need to “turn” the compost heap every few weeks so I recommend having four bins. That way you can empty one into another as you are “turning”. You’ll find that you accumulate several tools and miscellaneous items when you grow your own food. A shed is an absolute must. Even the most enthusiastic veg growers need a tea break every so often. It’s great to be able to sit amongst your work, take a breath, review progress, plan the next job and just “be”. Growing veggies benefits your wellbeing in so many ways. Fresh air, exercise, being surrounded by nature, getting your 5 a day and allowing yourself some headspace. It’s little wonder that so many of my clients are asking for a little allotment plot in their new gardens. What will you grow in yours? Contact Holland Landscapes to find out what it could cost to create a vegetable garden for your home and family. What does it cost to improve your garden?